"The Socialist Constitution is a disturbing read, breathtaking in the brutality of the totalitarian measures proposed, a trip down the rabbit hole of the twisted American Communist mind." Four days after the first occupiers arrived on Wall Street in September, the Harvard Crimson student newspaper offered editorial space to a Maoist fringe group called the Revolutionary Communist Party. 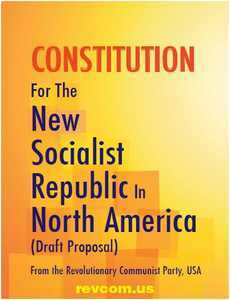 The article by RCP spokesman Ray Lotta urged replacing the U.S. Constitution with the Constitution of the New Socialist Republic in North America, which has been published as a 91-page book with a yellow cover. The RCP is not an underground organization. RCP Chairman Bob Avakian, the author of the Constitution, is in exile in Paris, but the RCP openly operates Revolution Bookstores in sixteen American cities, including Cambridge, Berkeley, New York, and Seattle, and is the publisher of Revolution magazine. Recently they were involved in creating the radical organizations Not in our Name and World Can't Wait, and according to Discover the Networks, the RCP played an instrumental role in sparking the 1992 Los Angeles riots. In order to bring this new socialist state into being, it would be necessary to thoroughly defeat, dismantle and abolish the capitalist-imperialist state of the USA; and this in turn would only become possible with the development of a profound and acute crisis in society and the emergence of a revolutionary people, in the millions and millions, who have the leadership of a revolutionary communist vanguard and are conscious of the need for revolutionary change and determined to fight for it. When Avakian talks about the "fight," he doesn't mean winning hearts and minds through education, persuasion and protest marches; he means armed struggle and the violent overthrow of the U.S. government with "armed forces and militia." Sedition seems so old-fashioned, but doesn't this qualify? [W]ith the advance of that revolutionary struggle, as territory was increasingly wrenched from the control of the imperialists, growing numbers of people who had been imprisoned under the rule of those imperialists came under the jurisdiction of the advancing revolutionary forces. These prisoners would then be re-educated to "become conscious partisans of the revolutionary cause." Thankfully, Avakian writes, "the right to employment and income is guaranteed...[and] 'common crime' has ceased to be a major social problem." Prisons are still required however for fat cat bankers and other enemies of the state who commit "political crimes," i.e., resisting the Revolution. 3. Autonomy for "minority and formerly oppressed nationalities." African-Americans have the right to vote on the creation of an autonomous region comprising "the southern part of the former imperialist United States of America." This decision will be made by a special vote, in which only African-Americans are eligible to participate. The African-American population of the southern states is around 35 million out of 115 million. Thus 80 million southerners will be displaced or disenfranchised. The same conditions hold for Mexican-Americans in "what was the southwest region of the former United States of America," and in other cities and regions with significant black or Hispanic populations. I hope Sean Penn and Susan Sarandon have been taking Spanish lessons. Native Americans will be granted autonomy with "the necessary territories but also the resources." All oppressed peoples are equal but some are less equal than others and require "special assistance and support." Avakian accuses Amerikkka of racism, but advocates the establishment of segregated, overtly racist regions. 4. Special Tribunals: Continuing the tradition of the French and Russian revolutions, and the Khmer Rouge regime, "special Tribunals" will be "established to preside in cases of war crimes and other crimes against humanity" committed by "former members and functionaries of the ruling class of the imperialist USA and its state and government apparatus." These enemies of the state will "be imprisoned or otherwise deprived of rights and liberties." The death penalty will be prohibited "once such circumstances of extraordinary emergency have been overcome." No word about whether public guillotines will be set up for Wall Street bankers and government officials. We read further that "those who played a leading role in opposing the revolution" will not be "accorded citizenship" and will be "deprived of the right to vote." 5. Prohibition of capitalism. Section 2: "The private ownership of means of production and other capital, and the hiring of wage labor by owners of private capital, shall be prohibited." Section 5: "Means of production, and other private capital and wealth of the former capitalist-imperialist ruling class of the United States of America, shall be expropriated, without compensation, and converted into state/public property." The power to abolish private property is absolute. Power corrupts and absolute power corrupts absolutely. 6. Immigration: Chairman Bob abhors the "xenophobic and fascist anti-immigrant atmosphere" of the imperialistic USA. He will grant citizenship to everyone currently living here, with the exception of capitalist enemies of the state. The Socialist Republic however is not an open borders state. Immigrants who apply for asylum "must follow the relevant laws and procedures which have been established" and must "pledge to act in compliance with the [Socialist] Constitution." This is more restrictive than our current immigration laws, although it might be irrelevant since Communist countries never have to worry about excessive immigration into their hellholes. American Communists and other assorted collectivists have spent decades hiding their true agendas under more palatable names like progressivism, socialism, cultural Marxism, anti-globalism, multiculturalism and global warming activism. Marxists like Saul Alinsky and Antonio Gramsci recognized that American soil was not fertile ground for Communism, and counseled a secretive strategy of gradual subversion from within, what Gramsci called "the long march through the institutions." It is therefore jolting to see Communists advocating for Communism without dissimulating their true intent. No doubt they expect that after decades of anti-capitalist, anti-American curriculum in schools and universities, and similar views in the press and pop culture, the long march has paid off, and the time for revolution has arrived. Ray Lotta has made appearances at Occupy Wall Street, but it doesn't appear that the RCP instigated or plays a leadership role in the demonstrations. It is disturbing however to imagine the Occupiers -- better described as the 1% than the 99% -- nodding their heads in agreement with the Socialist Constitution's most radical proposals, assuming that the key tenets could be condensed to 140 characters or scribbled on placards. Groups like the Revolutionary Communist Party can damage our country, but one hopes that despite years of indoctrination, a majority of Americans will continue to reject the ideas in this evil manifesto.